How do you feel about baking or cooking for people with food sensitivities, allergies, and such? I think it is a fun challenge to make something out of the ordinary, when standard basic ingredients are out of the question, for health reasons. Of course, eschewing ingredients – or categories, such as meat for vegetarians – may be a matter of personal taste or choice, which I always try to accommodate, too. I particularly like to find ways to bake and cook good things for those cannot tolerate wheat (celiacs, for instance) or dairy. Wheat and dairy, of course, are mainstays of baking, so the challenge can be a bit daunting in dessert preparation. On two separate occasions recently, I needed to bake, first, for a friend who currently cannot tolerate butter or nuts and then for one who never can eat diary or wheat. The day I needed to bake them for our first friend, I found a recipe in The Cookie Book, by Catherine Atkinson, Joanna Farrow, and Valerie Barrett, for “Malted Oaty Crisps.” Malt is an ingredient I really enjoy using, especially in conjunction with chocolate (Whoppers and Maltesers and other chocolate-malted milk balls are great confections, way up there in my book of candy favourites), so I keep malt powder in my pantry – and sometimes, the chocolate-malty candies, which do not last long enough to be a staple. Just a fork and a handful of ingredients make for super-fast prep. Without butter or flour and full of this is a wholesome cookie, with health benefits of whole oats and a modest amount of oil. The brown sugar provides a rich caramel tone complementing the crisp-and-chewy cookie texture; the edges are almost like candy. I replaced the perplexing malt extract with almond extract and a bit of water. 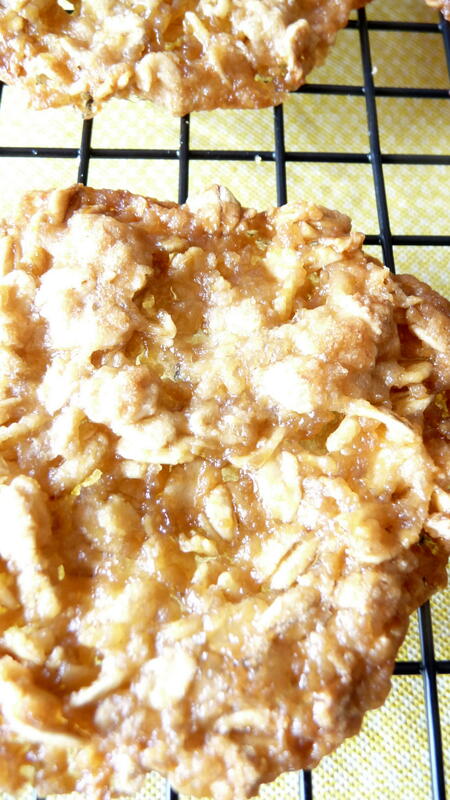 I also believe that chopped almonds could add another welcome textural variation. They go equally well with coffee and tea and would be a nice accompaniment for fresh fruit for a light summer dessert. 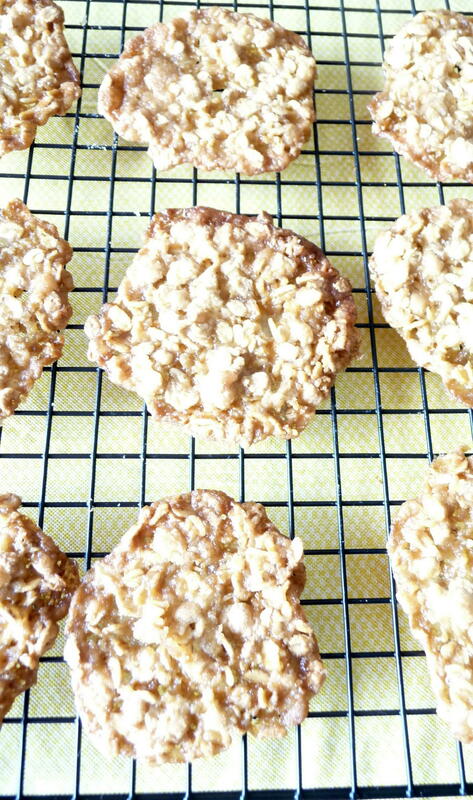 These cookies are delectable and easy enough to whip up that they make a good everyday treat. The cookies are thin and pliant, when baked, and one friend who was a professional chef (she of the blog-that-dare-not-speak-its-name) suggest that the cookies could be rolled into a tuile or a small cone, out of the oven – a very good suggestion. The just-out-of-the-oven cookies would wrap easily around the handle of a wooden spoon or a small cone form. 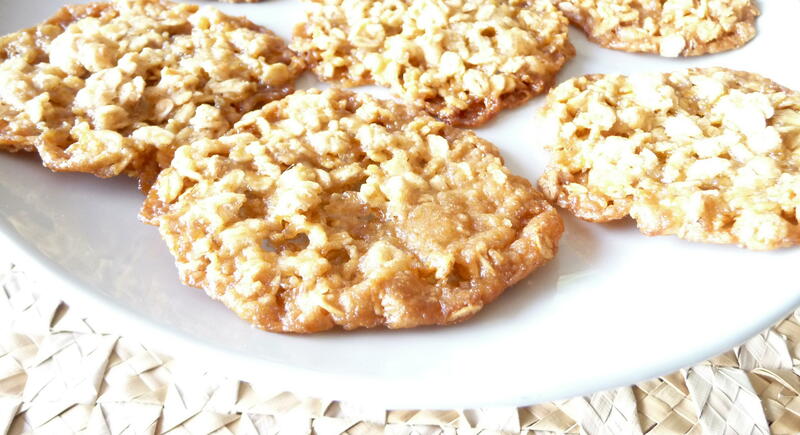 If you seek a super-fast cookie or one that is rather healthful or one for people with dietary restrictions or just a satisfying, crunchy, caramel-crisp cookie, this is a great choice. Place baking rack in middle position. Pre-heat oven to 350 degrees. Grease baking sheet, line with parchment, or use non-stick silicone baking mat. 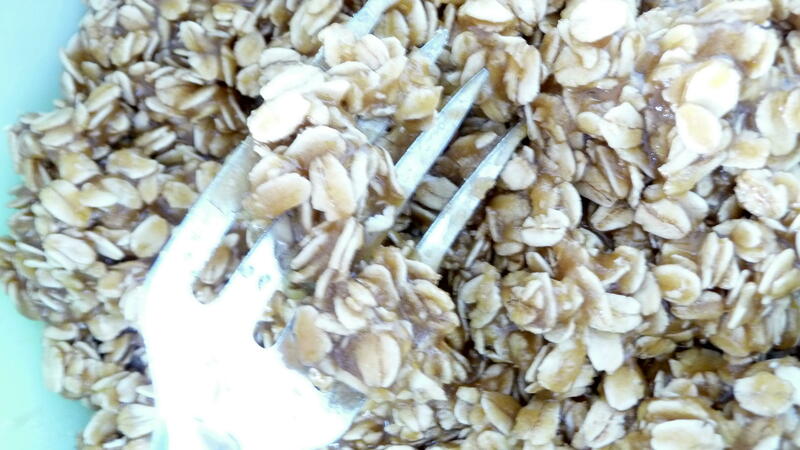 Mix oats and sugar in a bowl, using a large fork, preferably, to break up any lumps in the sugar. In a small bowl, mix the egg until just broken up, add oil, almond (or vanilla) extract and water (or malt extract, instead of these two last items) and add to oat-sugar mixture, blending until incorporated. Let rest for 15 minutes (at this point, the dough could go into the fridge for a day or two). Using a small ice cream scoop (tablespoon size), place mounds of dough on prepared sheets, leaving three inches between the fast-spreading cookies. Bake for 8-10 minutes or until golden brown. Cool on baking sheet for a minute and then remove carefully (I find a very thin but flexible silicone spatula with a pointed end to work well) onto a wire rack to cool completely. Enjoy with your sensitive or not-so-sensitive friends…. 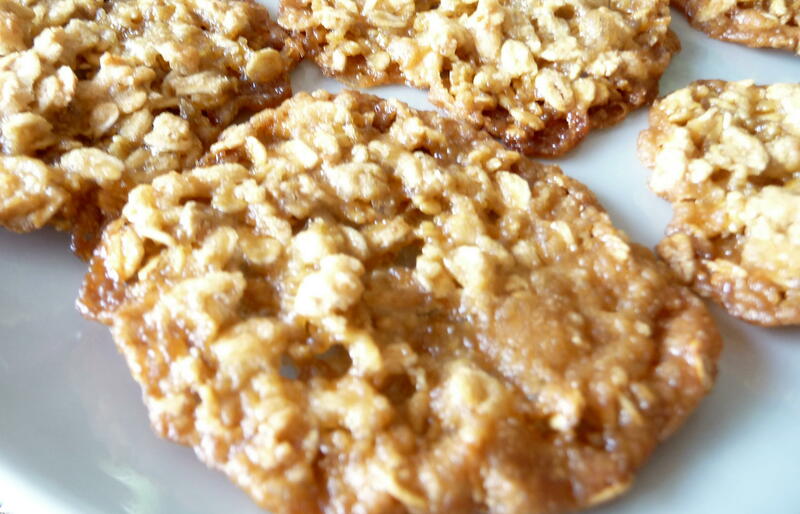 This entry was posted in Baking, Cookies, Dessert, Recipes Misc and tagged Brown Sugar, Cookie, crisp, crunchy, dairy-less, Dessert, easy, fast, Healthful, oats, wheat-free. Bookmark the permalink. Those sound delicious – a combo of my favorite cookie ingredients! I think the ingredients might be missing the egg? These look tasty, tasty, Mr Dan. Crunchy and chewy? As for malt extract. Well, I wouldn’t say it’s a common ingredient and I’ve certainly never used it, but I think you can get hold of it. From what I understand it’s used more in home beer-brewing, and adds a yeasty flavour to your food. I’m not sure I’d like it all that much – almond extract sounds much nicer! Hi, Jax (what I won’t say in transit at Heathrow…). They are crunchy-crisp on the perimeter and chewy in the middle – unless you overbake them, as I did once, then they are crunchy crunchy crunchy. I knew you’d know something about malt extract! I like malted milk with chocolate but it is different with oats. Almond extract makes it taste almost marzipan-y with its chewiness. I can attest to the deliciousness of these cookies. I’m one of those food sensitive (temporarily, I hope) people that Dan made them for – I ate six!